Well done to the winning team of Howard Ashenden (left) & Daron Maynard (right). Also a big thank you to the Kevin Roberts (center) who ran the event. 22/6/18 Unfortunately there are no Key Holders for the storage container who can make it along to Apex for this Sunday’s (24th June) afternoon free sail & scale meeting so the rescue boat will not be available. Obviously your welcome to float a boat but the rescue boat will not be on hand. 17/6/18 IOM Yacht Spring Series – congratulations to Nigel Clarke for winning the Spring Series once again. That’s 3 times in a row! 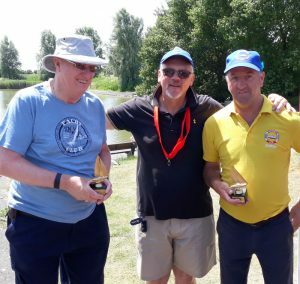 Good results for Sedgemoor IOM Skippers at district level – well done to John Stone for winning the MYA IOM South West District Series held at Yeovil on 10th June. It was a good day for Sedgemoor members with Bob Conner finishing 2nd, Richard Aucott 3rd and Daron Maynard 7th. 28/5/18 Open Tug Towing (27th May) – the event went very well on a perfect afternoon with 2 local clubs taking part in the competition plus quite a few other free sailing on the lake. A full report, scores and a few photos have been added – see the Scale section page on the main menu bar. 20/5/18 Open Tug Towing – Sunday 27th May from 1.30pm (following the morning’s Small yacht racing) we are running a one-off Tug Towing competition at Apex. It will be for two tugs to tow a tanker around an obstacle course – just like we did in the old SWAMBC days! We can provide a tug of two if you have nothing suitable to use. There is no entry fee, just turn up and have a go. The course will only take up a fraction of the lake in the left-hand corner so the rest of the lake will be available for anyone who wishes to free sail a boat or two. 22/4/18 The sale of the RC items donated to the club raised £81.50 at our auction today, the money will be passed onto BARB (Burnham Area Rescue Boat). A big thank you to all who supported this event. 19/4/18 For Sale – just added a MX14 IOM class racing Yacht. See For Sale page for info and photos 12/4/18 I’m very sorry to report that former club member Brian Oldham has passed away. A long illness had meant Brian was not able to sail his models at Apex for a while, he was a very nice gentleman and a good model builder. I’m sure you will join me in offering his wife Linda and family our deepest condolences at this very sad time. Russ 28/3/18 For Sale – just added a Kyosho Northwind 28 RC Yacht. See For Sale page for info and photo. 28/3/18 2018 calendar update – there have been a couple of small changes to our boating calendar. The new copy can be seen on the 2018 Calendar page. Tug Towing 27th May & SYS 9th Dec added to calendar Tug Towing has been moved from its usual slot on a Wednesday night to Sunday afternoon on 27th May, more about it nearer the time. Also, due to “Beast from the East part 2” wiping out the last Small Yacht round it has been rescheduled for Sunday 9th December. To keep it simple this one will be round 8! 25/3/18 Alice Trophy (IOM yachts) – At last, it seems that Spring has finally Sprung – at least for the day! 10 skippers took part in this annual long running IOM yacht trophy meeting. Nick Noble was in great form and won it by quite a margin in the end. See One Meter Yachts sub-page for a full report, scores and photos. Congratulations Nick. 19/3/18 For Sale – large collection of RC marine related items sold locally via Ebay. See For Sale page. 17/3/18 Small Yacht Series (round 2) 18th March CANCELLED – due to an Amber warning weather forecast tomorrows SYS meeting has been cancelled. 11/3/18 IOM Yacht Winter Series 2017/18 Bob Conner wins the series with a score of 172 points ahead of Nigel Clarke on 163 and in 3rd place Andy Harding on 148. Full score sheet plus overall points table has been added, see IOM Yacht pages. Congratulations Bob. 7/3/18 Litter picking at Apex Weds 14th March Assuming we are not hit by another blizzard the Litter Pick will take place next Wednesday 14th March 10am to 12pm. We will be meeting outside the parks office (adjacent to toilets) at 9.45am. Hopefully I’ll see a few of you there. 27/2/18 Litter Pick CANCELLED – due to take place this Friday 2nd March has been cancelled as the “Beast from the east’ is coming!❄☃ There is a very good chance the lake will freeze over in the next few days. It has done many times in the past when it gets well below freezing for a few nights in a row. 25/2/18 Litter picking at Apex Friday 2nd March 10am to 12pm – this year it is part of a nationwide The Great British Spring Clean campaign organised by Keep Britain Tidy. Our club together with the Friends of Apex Park Group will be litter picking in the park, we will mainly be tasked with collecting it from around the lakes. The Council will be providing us with litter pickers, high vis jackets and collection bags. If you can spare a few hours on Friday it would be very much appreciated, we will met up at 10am outside the parks office/toilet building, if you get there after look out for the high vis. It’s a good chance to get some exercise, clean the park of litter and our club will score some “Brownie points” – so, it’s win, win, win!. 25/2/18 IOM yacht Winter Series – round 8 (25th Feb) scores have been added. We had almost perfect conditions with a stiff easterly breeze and bright sun shine which meant it was not too cold. The RO Scott Smart set a triangle/sausage course with a gate at the down wind leg which made the short leg to the finishing line very close at times! Once again Bob Conner was in top form winning 5 races he easily won this round scoring 12 points, ahead of Richard Aucott (20) and Andy Harding (24). 24/2/18 SOLD – the green IOM Rocket yacht has gone!